February 2018: First (Legal) Untreated Sichuan Pepper in the U.S.
Hello, Friends of The Mala Market! Happy year of the dog! Our first Chinese New Year's gift to you is the first (as far as we know) legal Sichuan pepper to enter the U.S. since 1968 that has not been robbed of some of its potency by unnecessary heat treatment. Our second gift to you is a 15 percent discount off your entire order with the code CNY15 (good through Chinese New Year, Feb. 16). You could also consider these thank-you gifts for your patience as we have stabilized our sourcing and built up inventory. Some of you may have read an article I wrote in October after our spice-sourcing trip to Sichuan. (It ran in Roads & Kingdoms, Slate, and Long Reads.) I put on my journalist hat to report the history of Sichuan pepper in the U.S.: banned outright from 1968 to 2005 and then required to be excessively heat-treated—a torture no other spice has to endure—since the ban was lifted. I discovered in my research that the USDA quietly lifted the heat-treatment requirement at some point in the recent past, but that Sichuan pepper exporters in Sichuan have no idea that it has, and are still treating the peppercorns by heating them to 140 degrees for 10 minutes—or, due to misinformation, at even higher temperatures for up to a couple of hours. After a lot of cajoling and convincing, I finally talked our supplier into NOT heat treating the shipment that just arrived. So now I challenge you to see if you can tell the difference. Even our first shipment of heat-treated peppercorns from the fall 2017 harvest was potently fragrant and numbing, so perhaps only real aficionados will truly be able to discern the difference. I look forward to your feedback! We are also fully stocked in Sichuan chili peppers and most everything else, including our Sichuan pantry collections. We cannot always guarantee the availability of the products we do not import, but with our mega spice shipment having arrived we can guarantee top-quality Sichuan peppers, chili peppers and ground chilies for the foreseeable future. Thanks for sticking with us as we get this business rolling! P.S. Won't you do us a favor and share this news with your friends and fellow mala lovers? We have a third type of Sichuan pepper in our line up with the addition of Hanyuan pepper. This is red Sichuan pepper grown in Sichuan itself, in Hanyuan County, from which the most renowned Sichuan pepper hails. It is discernably different from our other red Sichuan pepper, da hong pao. The two species are equally loved in Sichuan, and the best of these two is up to your tastebuds. Can't decide which Sichuan pepper is right for you? Want to try them all? 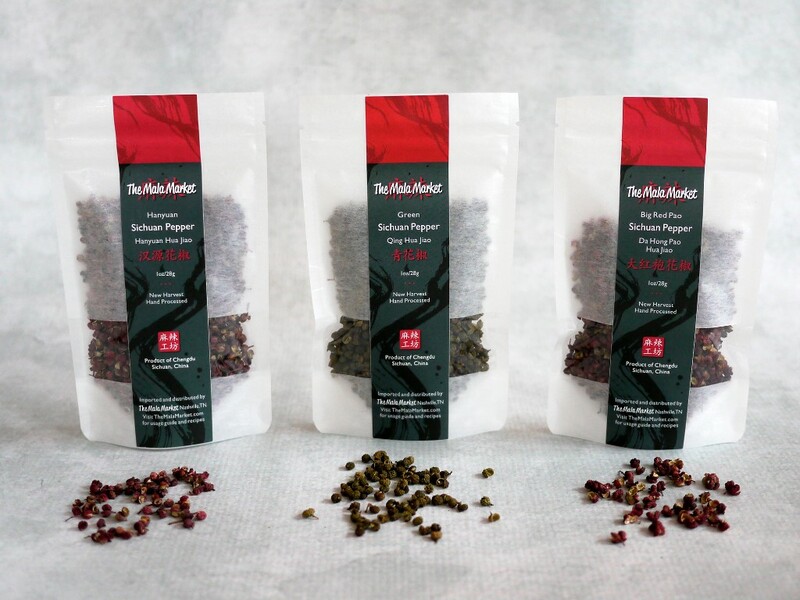 We have created a sampler with 1 ounce (about 1/2 cup) each of Hanyuan, Big Red Pao and Green Sichuan peppercorns. 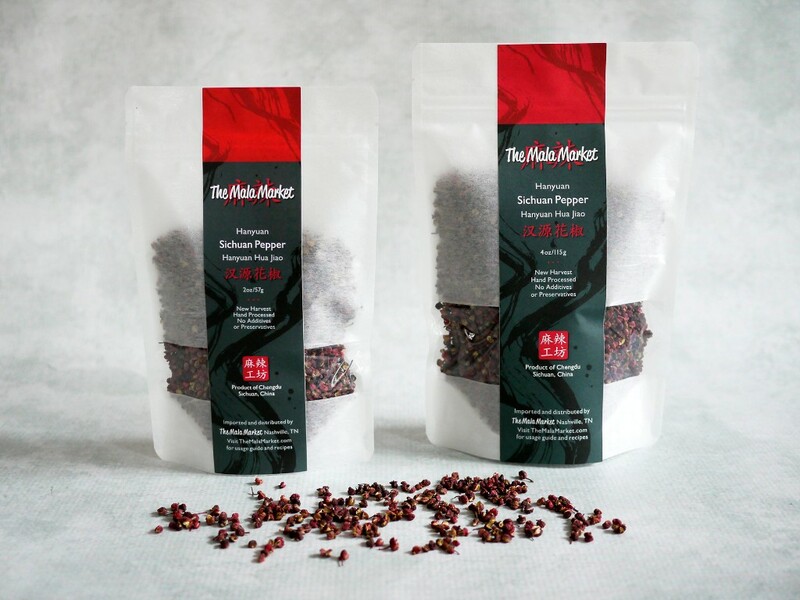 All our peppercorns are non-heat-treated, non-irradiated and completely natural, with no additives or preservatives. 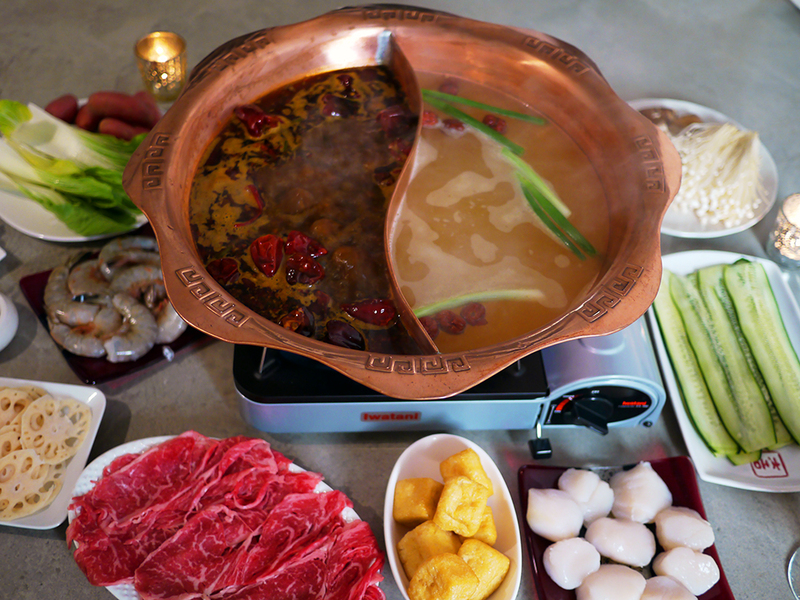 Our latest post on the blog is for Sichuan mala hot pot! I've finally perfected a from-scratch recipe with beef tallow as it's made in Chengdu and Chongqing. It's easier than it may sound at first to serve hot pot at home and well worth the initial investment to be able to make this ultimate party food. There is just something inherently festive about gathering around the bubbling pot and cooking your own food at your own pace while interacting in a real way with friends and family. It’s an activity. An event. Interactive entertainment that doesn’t involve a screen. I hope you'll try it! Hi Pamela! Always appreciate your valuable feedback and insight from Japan. I do not believe that heat treatment is/was a requirement in any other country. Having said that, I know some exporters heat all their product. So it’s a little murky… Do you buy Sichuan pepper from China or just use Japanese sansho? Great news about the new legal Sichuan peppers available in America. I have been following your blog from The Mala Project days. I have question: do the Sichuan pepper growers heat all the peppers they export to other countries like Japan, for example, or just what they were exporting to America? ?